Our Rosco Bolt Carrier Groups are designed to meet the modern-day carbine shooter’s requirements. We have also balanced input from our consumers and military end users in order to bring you the product you need, not just the one we want to sell you. 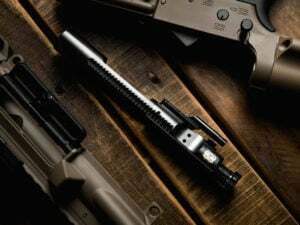 All Rosco Bolt Carrier Groups are to MIL Specification and have a properly staked gas key along with a Melonite coating for extended performance. They also feature a Shot Peened / MP tested Matched bolt (with upgraded extractor) which is designed to lock up perfectly with our extensions for extreme accuracy. These BCGs are made to withstand Full-Auto rated fire and unforgiving use from the end user.